Stay in the Bike Lane! I was recently yelled at by a pedestrian, of all people, that I shouldn’t be riding in the middle of the road, and should be over in the bike lane. I’m not certain what prompted this man to share his advice, since I wasn’t anywhere near him. Perhaps I just looked arrogant slowly riding my cruiser in the center of the lane as if I had the right to be there. While the bike lane going down 5th Street is quite nice, I was preparing to get into the turn lane to make a left and head north on Stewart Street. You can’t safely make a left hand turn across 2 lanes of traffic from the bike lane. The bike lane is for thru-traffic, and gives you a safe place to ride when this is where you are planning to go. From a cyclist’s point of view, I think the resources to crackdown on people riding bikes could be better used elsewhere. This doesn’t seem to be a problem in Carson City, but I do hear of these stings in Reno. While I don’t condone breaking the rules, you do need to be flexible with the law when on a bicycle, since most of our roads were designed with driving a car in mind. Following the rules all the time could get you hurt or killed. Law enforcement crackdowns would have a better return on investment if they went after the people endangering the most vulnerable users. Make the streets safer for people to get out of their cars, fewer cars on the road, less traffic problems. Here’s a video from New York City. This rider was actually ticketed for straying out of the bike lane! Well of course this made him mad, and he decided to make a short film about his experience. I ride the bike lanes as much as possible, but I’m glad these rules aren’t enforced here. Often road signs can’t be placed in the road or on the sidewalk, and they end up in the bike lane. 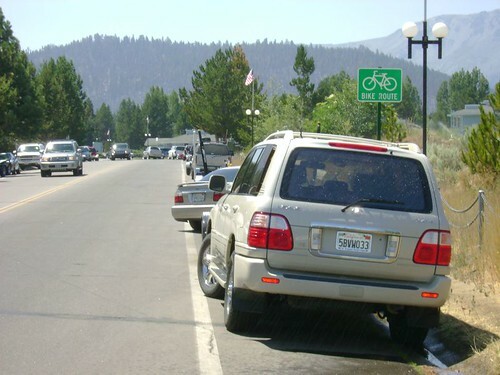 And sometimes people think the bike lanes are parking lots, as reported earlier here on Bike Carson, Highway 50 Bike Path Obstructions. Until the roads around the country are made safer for ALL users, law enforcement needs to back off a little. Especially in a country that REALLY needs to become energy independent to survive in the coming years. Bikes need to be a part of this future. I’m frequently reminded to get off the road that’s trying to sexually reproduce, although I can never tell how the motorist advising me so knows, and why (generally) he also would not get off the road if it’s trying to sexually reproduce. I’m sometimes told to get on the sidewalk that is trying to sexually reproduce, which leads to similar confusion. That is, of course, assuming that the voice coming from the car is something other than the usual unintelligible ululations I typically hear. I figure that such people don’t really want to have dialog with me–they just think I’m in their way. Never mind that more motorists lost more time to each other on our limited-access roads every day than lose to me in a month or more. I have to admit, that was the last time I rode my bike in Carson – a good 8 months ago. I was just starting out (riding near-daily, and loving it), and while I was prepared for some ire from motorists, it’s another thing to have the law angry at you – and honestly not knowing what I did wrong made me reluctant to get back on the road, lest I should repeat my mistake. I want to ride safely, and not having much personal experience to rely on, I didn’t want to get out on the road and be a danger to myself or others by way of ignorance. I tried contact the sheriff’s office directly, to ask what I did wrong, so I would know not to repeat the mistake, but never got a response. My assumption was (and is) that while riding in the bicycle lane is preferred, bicycles should act (and be treated like) vehicles… in this case, merging to the left to turn left. It sounds like this is common practice, but is there any law on the books that says as much? For the most part, my cycling experience around Carson City has been pleasant. I rarely have any confrontations. I think part of it is because I ride like I’m supposed to be there. Taking the lane when appropriate, but moving over to keep the traffic flowing…but not so far that I’m saying, “Gosh I’m sorry, let me get back in the gutter…”. Riding as part of traffic seems to give you more respect. Possibly because you’re more predictable.